It’s become extremely obvious, especially within the past few years, that Earth’s dependence on fossil fuels is not needed at all. Yet we continue to create war, destroy the environment and harm mother Earth so we can continue using the same old techniques that generate trillions of dollars for those at the top of the energy industry. Corporate media continues to push the idea that we are in an energy crisis, that we are approaching a severe problem due to a lack of resources. It’s funny how the same group of shareholders that own the energy industry also own corporate media. This seems to be both another fear tactic and another excuse to create conflict. How can there be a lack of resources when we have systems that can provide energy without any external input? This means that these systems could run for infinity and provide energy to the entire planet without burning fossil fuels. This would eliminate a large portion of the ‘bills’ you pay to live, and reduce the harmful effect we are having on Earth and her environment. 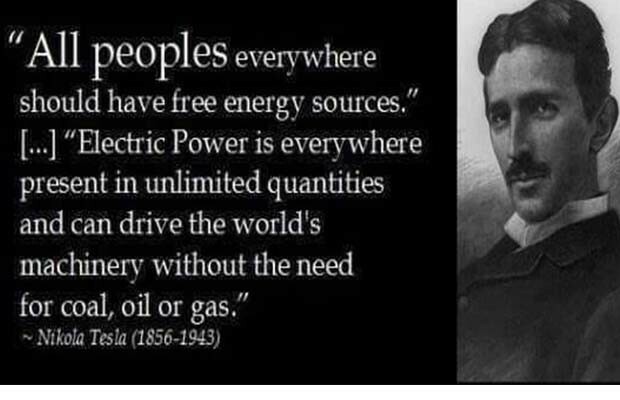 Even if you don’t believe in the concept of free energy (also known as zero-point energy), we have multiple clean energy sources that render the entire energy industry obsolete. This article however will focus mainly on the concept of free energy which has been proven time and time again by researchers all across the world who have conducted several experiments and published their work multiple times. A portion of this vast amount of research will be presented in this paper. These concepts have been proven in hundreds of laboratories all over the world, yet never see the light of day. If the new energy technologies were set free world wide the change would be profound. It would affect everybody, it would be applicable everywhere. These technologies are absolutely the most important thing that have happened in the history of the world. – Dr. Brian O’Leary, Former NASA Astronaut and Princeton Physics Professor. The Research These concepts are currently being discussed at The Breakthrough Energy Movement Conference. The Casimir Effect is a proven example of free energy that cannot be debunked. The Casimir Effect illustrates zero point or vacuum state energy, which predicts that two metal plates close together attract each other due to an imbalance in the quantum fluctuations(0)(8). You can see a visual demonstration of this concept here. The implications of this are far reaching and have been written about extensively within theoretical physics by researchers all over the world. Today, we are beginning to see that these concepts are not just theoretical, but instead very practical and simply very suppressed. Vacuums generally are thought to be voids, but Hendrik Casimir believed these pockets of nothing do indeed contain fluctuations of electromagnetic waves. He suggested that two metal plates held apart in a vacuum could trap the waves, creating vacuum energy that could attract or repel the plates. As the boundaries of a region move, the variation in vacuum energy (zero-point energy) leads to the Casimir effect. Recent research done at Harvard University, and Vrije University in Amsterdam and elsewhere has proved the Casimir effect correct (7). A paper published in the Journal Foundations of Physics Letters, in August 2001, Volume 14, Issue 4 shows that the principles of general relativity can be used to explain the principles of the motionless electromagnetic generator (MEG)(1). This device takes electromagnetic energy from curved space-time and outputs about twenty times more energy than inputted. The fact that these machines exist is astonishing, it’s even more astonishing that these machines are not implemented worldwide right now. It would completely wipe out the entire energy industry, nobody would have to pay bills and it would eradicate poverty at an exponential rate. This paper demonstrates that electromagnetic energy can be extracted from the vacuum and used to power working devices such as the MEG used in the experiment. The paper goes on to emphasize how these devices are reproducible and repeatable. The results of this research have been used by numerous scientists all over the world. One of the many examples is a paper written by Theodor C. Loder, III, Professor Emeritus at the Institute for the Study of Earth, Oceans and Space at the University of New Hampshire. He outlined the importance of these concepts in his paper titled Space and Terrestrial Transportation and Energy Technologies For The 21st Century (2). There is significant evidence that scientists since Tesla have known about this energy, but that its existence and potential use has been discouraged and indeed suppressed over the past half century or more (2) – Dr. Theodor C. Loder III Harold E. Puthoff, an American Physicist and Ph.D. from Stanford University, as a researcher at the institute for Advanced Studies at Austin, Texas published a paper in the journal Physical Review A, atomic, molecular and optical physics titled “Gravity as a zero-point-fluctuation force(3)”. His paper proposed a suggestive model in which gravity is not a separately existing fundamental force, but is rather an induced effect associated with zero-point fluctuations of the vacuum, as illustrated by the Casimir force. We’ve had major military people at great risks to themselves say yes these things are real. Why do you think the military industrial complex doesn’t want that statement to be made, because you start thinking about what kind of technology is behind that, that’s the bottom line. – Adam Trombly, Physicist, Inventor As illustrated multiple times above, the energy these systems use is extracted from the fabric of the space around us. That means it cannot be metered, which creates a threat to the largest industry on the planet, energy. An industry that is partly responsible for the destruction of our planet, and an industry that rakes in hundreds of trillions of dollars every year. No blame is to be given, only a realization is to be made that we have the power to change this anytime we choose. These technologies would completely change everything, but it’s important to remember that operating technology depends on what level of consciousness the operators are operating it at. Is the human race ready for such a transformation? Nothing can work unless the consciousness behind it comes from a place of love, peace, co-operation and understanding. The desire for the benefit of all beings on the planet would be the driving force for the release of these technologies. These technologies are locked up in black budget projects, it would take an act of God to ever get them out to benifit humanity (2) – Ben Rich, Former Director of Lockheed’s Skunkworks Division I hope I’ve provided enough information here for those interested in furthering their research on the subject. There is a lot to this technology, and it branches into many other areas from ancient history to sacred geometry and all the way to UFOs. The technology described in this paper is similar to what Dr. O’Leary states here with regards to propulsion systems and an isolated field of energy. For more on this subject, please visit our exopolitics section under the alternative news tab as it does correlate with the technology of anti-gravity and free energy. Collective Evolution has covered this topic before. We’ve demonstrated the reality of the Searl Effect Generator. We’ve also written about the Free Energy Devices. This article was simply to provide you with more information and research to show you just how applicable these concepts are and the tremendous implications they can have.